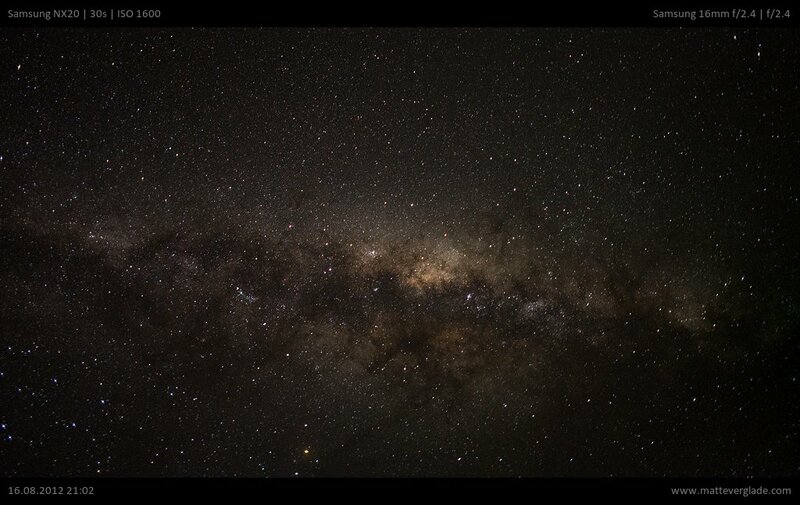 I often get asked how to shoot a night sky / starry sky. I am not a specialist in this fields and there are better camera systems than the NX system to do astrophotography, but it’s definitely not impossible to do some kind of astrophotography. You can mainly do either star trails (capture the motion of the stars due to the rotation of the Earth) or you can simply shoot what you are seeing like in the photo below. With this article I will set the focus on the second alternative as star trails are a problem for newer NX cameras, but at the end of the article is a short round up about star trails, too. In this guide I will give you a short overview over the most important settings you can find in the Menu of your camera. I will give practical hints how to use these settings best. You should have read the Introduction to the basic concepts of photography first as the mentioned names and concepts are required to understand this guide. You should’ve read your camera’s manual, too, as I won’t repeat what Samsung has already described for you. In brackets after the name of the setting I am providing my recommendation / my used setting.